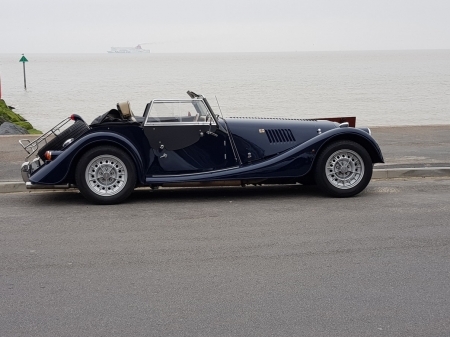 Rather cleverly the bench behind the Mog is in shot at Felixstowe old Beach. It isn't a modification to the car! It was my usual Thursday walking group event today. Given the weather & the need to get the spare wheel rebalanced I took the Mog. At Languard lookout point café we stopped for lunch & watched the container ship docking. After 15792 steps I got into the Mog & went to these guys. They rebalanced the wheel for free. looks like a grey day John V6 how about using one of those containers to ship the mog to a distamt destination and join up later for a drive...the morgan 3 wheeler group have just done that and are touring new zealand! Great stuff John V6 - does the foot ferry still run between Shotley Gate and Harwich out of curiosity? I would love to ship the car to NZ but don't fancy not having it for the 6 weeks or so either side. As one Mog owner said just buy a second one, head office disagreed! Yes the ferry is running now it is spring. good to see your getting out and about.